Dozens of long-distance truckers set up protest camps on the outskirts of Moscow to protest a new Kremlin-sanctioned road-levy, which they say amounts to highway robbery. KHIMKI, Russia — Mikhail, a gruff, wiry man who has been driving trucks since he was 21, says a new road tax imposed last month reminds him of the perils he faced on Russia’s lawless roads in the chaotic period after the Soviet collapse. “Now, it’s basically the same thing, only it is happening on a nationwide scale — and it’s the government that controls it,” he adds. The suspicion that they are the victims of Kremlin-sanctioned highway robbery, along with fears for their livelihood in a business in which turning a profit was already tough, have prompted thousands of Russian truckers to protest over the past two months. Saying it needs more money to repair Russia’s notoriously bad roads, the government imposed a levy of 1.5 rubles ($0.02) for each kilometer heavy trucks travel, effective from November 15. It entrusted collection to a company controlled by a son of construction magnate Arkady Rotenberg, a former judo sparring partner of Putin who has landed billions of dollars in state contracts. After mobilizing for a series of protests that snarled traffic in several locations across Russia’s 11 time zones, scores of truckers converged on Moscow last week, grabbing public attention and raising a potentially serious new challenge for Putin from a group long at the heart of his working-class electoral base. Truckers say the tax threatens to bankrupt them and harm a broad range of consumers by driving up prices for food and goods shipped by truck, adding to pressure on family budgets in a country facing economic troubles fueled by low prices for its oil exports and Western sanctions over its interference in Ukraine. They are also angered that the payments will be collected by Rotenberg, whose company controls the computerized payment system called Platon. Mikhail is one of dozens of truckers to take their protest to the Russian capital, navigating myriad police checks and controls on the roads on their way to the outskirts of Moscow, where they set up two small protest camps. He left his wife and 20-year-old daughter behind in Nizhny Novgorod, 400 kilometers east of Moscow. “They’re worrying and waiting for good news,” Mikhail says. The authorities have used multiple channels to rein in the protest, with some success. Small political concessions were made on December 4 by lawmakers who voted to decrease fines imposed on those who fail to pay. Meanwhile, police have been effective at preventing the truckers from assembling in Moscow for a major protest action — the reason also, Mikhail says, that only a few dozen truckers have made it to the Khimki parking lot. But perhaps more important is what protesters like Mikhail represent: a rare example of openly anti-Kremlin sentiment stirring within Putin’s traditional working-class electorate, a support base that has been politically docile despite the country’s recession. These are not the urbanites who hit the streets for a series of political protests that failed to prevent Putin from returning to the Kremlin in 2012 after four years as prime minister. Mikhail says he has been a staunch supporter through most of Putin’s 16 years in power. But that changed in the space of a single hour on December 3, when Putin made no mention of the truckers or their plight in an annual state-of-the nation speech. For Mikhail and other truckers, gradually falling living standards and now this new road tax are calling into question one of the key narratives of Putin’s rule — that he has provided the stability many Russians craved after the collapse of the Soviet Union in 1991. Putin’s poll ratings remain sky-high, but the truckers’ protest is a sign of anger at the unravelling social contract. Some Russian commentators have compared the truckers to striking miners who blocked highways in the 1990s to protest wage arrears, and some see them as a harbinger of labor unrest to come. In a reflection of Kremlin concern, state TV networks have kept the truckers largely off-screen. Mikhail and other truckers at the shopping mall in Khimki, just off the main Moscow-St. Petersburg highway, find themselves locked out of crucial access to TV airwaves despite what for some of them has been years of support for Putin. The spontaneous encampment of some 20 truckers in the parking lot outside an Ikea store is emblematic of the haphazard, grassroots character of the protest. The camp consists of a disparate group of long-haul drivers from regions like Vologda, Arkhangelsk, St. Petersburg, and Nizhny Novgorod. The movement sometimes seems disorganized, its participants unsure about their collective plan. But Mikhail and many other protesting truckers share deep suspicion of political parties and opposition groups, such as the Communist Party and Kremlin foe Aleksei Navalny’s Progress Party, which have voiced support for the truckers. Mikhail’s hopes for change lie elsewhere. He said he intends to stay in Khimki and try to get the message of the truckers to the rest of the Russian people. “We want the government to see that the people are not idiots,” he says. 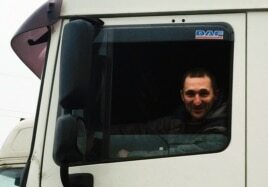 Be the first to comment on "Portrait Of A Trucker: New Breed Of Russian Protester Hails From Putin’s Electorate"